Ibrahim Haron is a board-certified oral surgeon trained in all aspects of oral and maxillofacial surgery including dentoalveolar surgery, trauma surgery, TMJ surgery, dental implant placement, and facial reconstruction surgery. 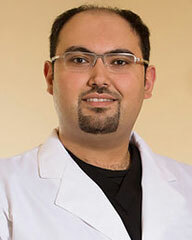 Following dental school, Dr. Haron completed a residency in Oral and Maxillofacial Surgery at Emory University. During his training at Emory, Ibrahim Haron completed rotations in anesthesia, surgical critical care, emergency medicine, trauma surgery, otolaryngology, oculoplastics, plastic surgery, and several others. Dr. Haron was chosen as chief resident during his training, demonstrating leadership and skill that has helped him excel throughout his successful career. Dr. Haron also co-authored numerous textbook chapters and participated in multiple advanced courses in craniomaxillofacial trauma, orthogenetic surgery, and maxillofacial reconstruction. Dr. Haron is a Diplomate of the American Board of Oral and Maxillofacial Surgery, a Fellow of the American Association of Oral and Maxillofacial Surgeons, and a member of the American Academy of Cosmetic Surgery and the American College of Oral and Maxillofacial Surgeons. He stays well-informed about the latest news and advancements in oral and maxillofacial surgery by attending seminars and continuing education programs. Dr. Ibrahim Haron maintains Basic Life Support (BLS), Advanced Cardiac Life Support (ACLS), and Pediatric Advanced Life Support (PALS) certifications. For Dr. Haron, involving patients in the decision-making process and helping them understand all steps and procedures is a critical part of his job as an oral surgeon. It is important for patients to feel comfortable and confident in their treatment.